Sitting nice and snug inside the Frabill, it was hard to believe what had just happened. Jigging for walleyes at the end of a sweet little point, I’d watched on the camera screen as a good fish had swept in for a closer look at my spoon. Just as I began to anticipate a bite and hookset, a curious thing occurred. Instead of striking, the walleye just hovered there, inches from my lure, refusing to eat. I quivered the lure in place enticingly, even got the fish to chase up a few feet up before giving me another sound snubbing. Finally, amazingly, inexplicably, the minnow head dancing on the end of the treble hook shook itself free and fluttered down to rest on the bottom. Before I could even reel up and re-bait, the walleye dashed in, and with a violent flush of debris, vacuumed the minnow head right off the bottom. What the . . . ? A short time later, Jon Marshall, MarCum Technologies Brand Manager, called to recount an interesting (and familiar) tale. Marshall and crew, it seemed, had just been out testing their new VS825SD color cameras on a lake near Minneapolis, when they made an amazing discovery. “We captured some really interesting video today,” Marshall recalled. “Found a pretty nice school of walleyes out there, but they absolutely would not bite. Until . . . he-heh-heh,” he cackled, anticipating my sudden curiosity. But the story didn’t end there. 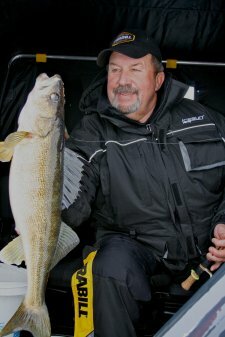 Marshall and crew began that evening to experiment with different bottom-bound bait presentations, scratching out respectable catches of walleyes, all while the bite remained nearly nonexistent for other anglers hammering away with traditional baits and presentations. Roach continues: “This is a great sight bite for using an underwater camera. In fact, it’s a necessary piece of gear here, because you need to keep your bait positioned perfectly, literally millimeters from bottom. Our MarCum’s are also essential for showing you those ultra-subtle bites you can miss if you’re fishing by feel alone.” The presentation, Roach reports, involves a 1/16-ounce Northland Forage Minnow Spoon or Live Forage Moxie Minnow fished stationary as a deadstick. He rigs each spoon with one of Northland’s new clip-on Bait-Chain Dropper Hooks, and tips it with a tiny lively shiner or fathead minnow. Which brings us back to Marshall. After a little more investigative journalism on the part of yours truly, even MarCum’s Marshall, who’s usually super-secretive about hotspots and clandestine bites, finally spilled the beans on his secret bottom-bound bait method. “Take your favorite spoon,” he reluctantly offered. “I like a Kastmaster or Northland Buck-Shot. Then remove the treble and tie a super-long dropper line to the lower split ring.” Super long, in Marshall’s case, means a 6- to 10-inch length of 6-pound test monofilament tied to a #6 Eagle Claw 186 Baitholder hook. Thread on one to three fresh minnow heads or half a severed fathead or shiner minnow.